Margaret Dell is 96, but you'd need to check the birth date on her driver's license to believe it. Sporting a baseball cap with a Harley-Davidson logo on it, she is the designated driver for her seventysomething friends who no longer feel comfortable behind the wheel. Last winter a snowfall threatened to keep her from her appointed automotive rounds. She took a shovel and cleared a path to her car. Driving keeps Dell young. That and knitting. She constantly knits. She makes baby booties and caps and blankets for friends and family whenever a baby arrives  the newborn getting an early blessing from the ageless. And every month, she donates several blankets to a charity for unwed mothers. Driving, knitting ... and tennis. She plays two or three times a week. She has a much younger doubles partner who "covers the court. I'm a little afraid to run too much because of the circulation in my legs," she explains. When she was in her 80s, she played in a doubles tournament that required that the ages of both partners add up to at least 100. Her partner was in his early 20s; they won the tournament. Driving, tennis, knitting ... and eating chocolates. She keeps them in a drawer by her easy chair. "I am very bad about those Hershey Kisses," she confesses. "And I love those little Dove ice cream things. I take one before I go to bed." That's the only medication Dell will take without a fight. She's no fan of doctors. Some years back, she took a fall, and her doctor prescribed an MRI. "I just refused to go," she says. "They were having a party. It was my 90th birthday." And the party girl left his office. Fortunately, nothing was broken. But Dell knew that. More than what she knows, it's how she glows that impresses people. "She has a light in her eyes that is very alive, alert and interested," says Carole Dell. "It radiates over her whole face. Her face is kind of timeless. It's deeply lined, but she's actually beautiful." Spoken like a proud daughter-in-law with 96 reasons to be proud. Ninety-six and counting. How does science explain someone like Margaret Dell? How can a woman closing in on the start of her second century be so robustly, almost defiantly, healthy, while men and women decades younger are languishing feebly in nursing homes, plagued with failing bodies and failing minds and wishing they hadn't been so unlucky as to live so long? For most of human history, a long and healthy life has been shrugged off as a gift from the gods  or maybe the undeserved reward for a lifetime of plain cussedness. But to gerontologists, the vagaries of aging have become the focus of intense scientific research. 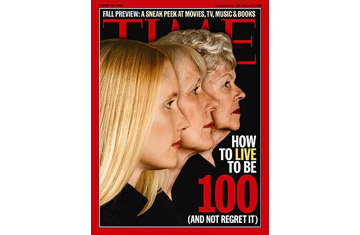 See TIME's special report: "How to Live 100 Years."